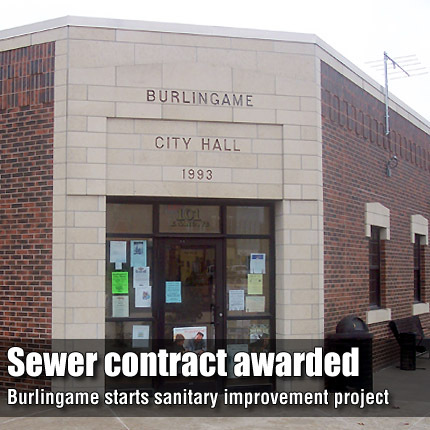 BURLINGAME—By a vote of 5-0, the Burlingame City Council awarded a construction contract totaling $855,402.30 to Emcon Construction, of Topeka, for the first phase of a sanitary sewer system improvement project. The contract was awarded during the Jan. 17 council meeting. Emcon’s base bid was $698,952. Work involves replacement of a major portion of the main that carries effluent along Kansas Avenue to the city’s sewage treatment facility. The contract award included $115,750 for rock slope protection to prevent further bank erosion of the city’s three lagoon cells. The contract also includes $40,700 for installation of equipment for a sewer lift station. The replacement equipment would be purchased by the city through a separate contract with a lift station equipment manufacturer. Construction plans and specifications were prepared by BG Consultants, Inc., which released advertisements for bids in December. Base bids ranged from $698,952 to $991,879. The engineer’s estimate was $880,200. In January of last year, the city was awarded a community improvement grant of $500,000 through the Kansas Small Cities Community Development Block Grant Program. The balance of the project’s funding is being provided through the U.S. Department of Agriculture Rural Development. Construction is contingent upon authorization by the funding agencies. In other discussion, the council met with attorney Caleb Crook, representing city attorney Rick Godderz, in a follow up to council concerns about requirements of the Burlington Northern Santa Fe Railroad for liability insurance for the sewer project. Crook reported that discussion with a BNSF contract specialist revealed that the railroad mandated liability insurance for any work along its right of way. The council authorized payment of $4,100 for permit fees required by BNSF, and authorized Burlingame Mayor Ray Hovestadt to sign the permit license. Also during the meeting, Burlingame City Council Member Rosie Parker said placement of stop or yield signs on streets intersecting Kansas Avenue had been discussed last summer. She questioned why no action had occurred. Hovestadt said placement of stop signs required enactment of an ordinance, but the council did not take action to do so. Placement of yield signs does not require an ordinance. The council adopted a motion to install yield signs and assess citizen feedback. In other business, the council approved renewal of a plumbing license for Blue Dot Services, and electrical and plumbing licenses for Bill’s Service Unlimited.